Below you can find driving directions from Google Maps to help you get from Davie to your nearest Fix Apple Now store, situated in Weston. You can either copy the driving instructions below or click here for a larger map and driving directions. specialise in mending, fixing, repairing, replacing and resetting broken Apple devices in Davie. Our engineers are amongst the best and most experienced in the business and can deliver the outstanding repair services you've been looking for. We want to know if you're faced with a broken iMac, iPhone 4, 5 or 6, iPad, iPod or MacBook Air or Pro. We have vast experience when it comes to fixing broken Apple products and always strive to get your beloved device back to you quickly. Contact us today if your home button won't work, you can hear crackling through your headphones, you can see enlarged icons, you have a cracked or frozen screen, you can't hear during calls, your camera won't work or your device is simply behaving oddly. 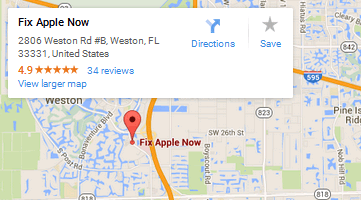 Why not get in touch right now if you need to find Apple repair services in Davie?